I’m always a bit nervous when a new employee joins my team. I know the employee’s nervous too. New faces, new projects, a new company. It’s a lot to take in. When the new hire orientation is done right, it gets new hires through the jittery nerves, grounds them, and helps build momentum through the rest of the onboarding process. They’ll have clarity on what they need to focus on so they can channel their excitement in the right direction. People love making a tangible impact and seeing the benefit of their work. Great orientation programs make that happen as soon as possible. When they feel the impact of their work, they love their new role and become a committed employee for the long term. Orientation vs Onboarding – What’s the Difference? Some folks use these terms interchangeably, we prefer to keep them distinct. 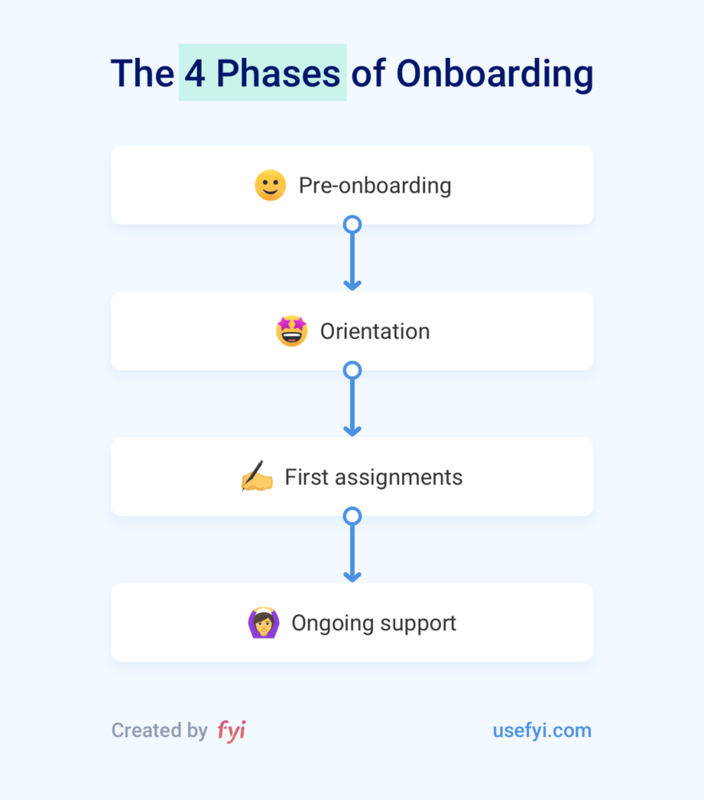 For us, onboarding is the entire process that begins with a new employee signing their offer letter and ends when they’re completely ramped up by becoming a fully productive member of the team. It’s a long process that can easily span several months. We break down our ideal onboarding process here and have a 22 item checklist for onboarding. Orientation, on the other hand, includes the structured welcome activities during the first few days of the employee starting. For a small company, this could be a simple as an office tour, filling out the HR paperwork, and a happy hour to meet everyone. Large companies usually have multi-day agendas that feel more like a mini-conference. When you’re hiring dozens or hundreds of people every week, large group orientations are the only way to cover all the required material. The main mistake that we see new managers make is to assume that onboarding only includes orientation activities like welcome meetings, signing HR documents, and getting an office tour. 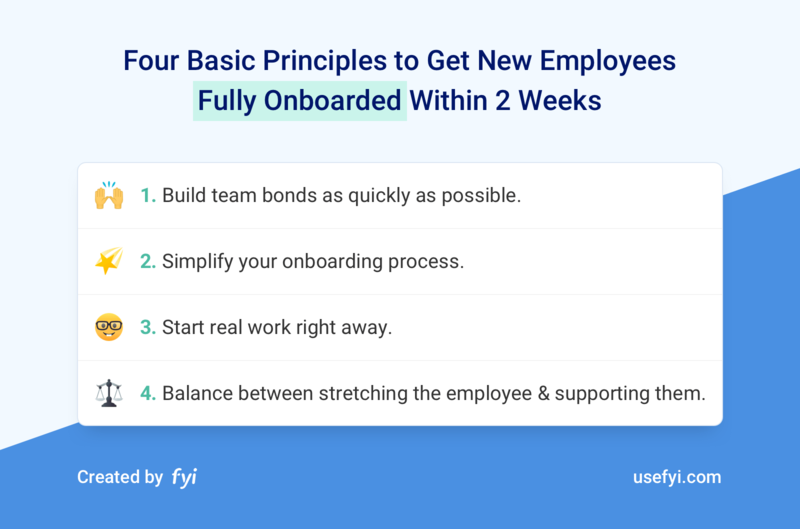 Successful onboarding includes a lot more than that if you want new employees to become fully productive quickly. For now, let’s go deep into orientation. When designing an orientation program, I follow these best practices. During the orientation step of onboarding, you’ll want to prioritize two of these principles. First, help the new hire to start building bonds with the rest of the team during orientation. Facilitate connections with other new hires that start on the same day, their manager, and their initial team. Anything you can schedule during orientation that helps kick start these bonds goes a long way to ramping the employee up during their onboarding process. They’ll rely on those relationships as soon as they start the work of their role. Be careful though, icebreaker activities don’t lead to genuine bonds. I like to stay away from icebreakers and get people working together on real projects. Or by creating activities where people tend to socialize naturally, like happy hours and team lunches. We have an entire list of new employee orientation ideas to help you build these bonds. Second, you want to set the employee up for doing real work right away. The best way to do that is by giving the new hire a strong foundation in the company values and goals during the orientation. What are you trying to accomplish as a company? Why do you exist? What are your primary goals for the year? Get time blocked off to handle these items so that they’re completed and the employee can quickly move on to more important work. Schedule the most important activities early in the day. In the morning, people generally have more energy, more enthusiasm, and better memories. Take advantage of this by scheduling the most crucial sessions during the first half of the day. New hires also have a lot of nervous energy and adrenaline on their first morning. Try to channel this energy as best as you can. Then use the afternoon for tasks that need less critical thinking and attention. As a manager, I’ve found it easy to slip into an agenda that puts the easy tasks in the morning and the harder tasks towards the end of the day. When a new employee walks into my office, the first thing that I want to do is give them a tour. But tours don’t require much attention, it’s much better to do them during the afternoon lull. Early afternoon is another good time to jump into a productive activity. Try to have everything important completed by mid-afternoon when people start to slow down. The smaller the company, the more informal orientation tends to be. This makes perfect sense. If you only hire 1 or 2 people a year, there’s no need to have an elaborate orientation program every time. But you still want to have an orientation program of some kind. A lot of small companies skip orientation entirely and it’s a missed opportunity. Even if your orientation only involves one new hire at a time, carve out a few hours to give them context on the company’s values and goals. Also help connect the new hire to key people throughout the company. There’s no need to hold an elaborate event or get a giant bag of company swag like larger companies, focus on helping the new employee understand where the company is going and help them build bonds with their team. Then quickly jump back to all the pressing work that I need to get done. If I want to set the new hire up for success, I need to put in that extra work during their first day. That means going through our mission, vision, and values with the new employee, taking extra care to nurture those first few connections with other people on the team, and making sure the employee understands what success looks like. The more effective I am with all this, the sooner the new hire will make a tangible impact on the company and make it easier for me to hit my own goals. Push yourself to add extra structure to your orientation, most small businesses err on the side of way too little. Since new employees don’t join smaller companies as often, it’s super easy to forget basic tasks. We forget to have that one HR form signed, a laptop assigned, or even a desk reserved. Not only are their legal implications on some of these items, but it also gives the new hire a horrible impression of how the company operates. I’ve found it essential to use an onboarding checklist for the entire process. It’s the only way that I can make sure I don’t forget the important tasks. It’s the only way to ensure every new employee receives the critical company-wide information that they need. If every new hire receives an orientation from their direct manager, there will be a high variance material and quality. You’ll need dedicated staff to run your orientations in order to ensure consistency and quality. Scale demands it. When dozens or hundreds of people join your company every week, it’s extremely inefficient to have every manager give tours, run through the company values, assign equipment, and handle all the other required tasks that new employees have to complete during the first few days. Group orientations very easily. Rotate between “active” and “passive” sessions during the day. The office tour. This gets everyone walking around and is the perfect opportunity to break up the agenda whenever you need to. It doesn’t need any setup or introductions like other breakout sessions. Schedule the office tour during the day that you need a break but don’t have another obvious active session to segue into. include discussions, and give everyone a chance to participate. Even better, these active sessions take pressure off the orientation presenter. Doing 8 hours of non-stop presentations is a herculean feat. Doing 3-4 presentations broken up by breaks is much more manageable. The new employees want breaks, the organizer wants breaks, everyone benefits. Some companies have enough new hires joining that they’re forced to run an orientation week every single week. This typically only happens at massive companies that are doing a ridiculous amount of hiring. If that’s you, these are easy batches to manage. Have all employees start on a Monday and they’ll easily fit into an orientation batch. But what do you do if you have too many hires to do orientation individually but not enough weekly hires to warrant a weekly orientation event? Schedule your orientation once a month and have all the new employees that joined during the previous month attend. Yes, some of them will have worked for several weeks before attending so it’s not perfect. Their manager can do a mini-orientation to get them going before they attend the full orientation program with all the other new employees. That allows you to keep hiring at full speed while also scaling your orientation program efficiently.